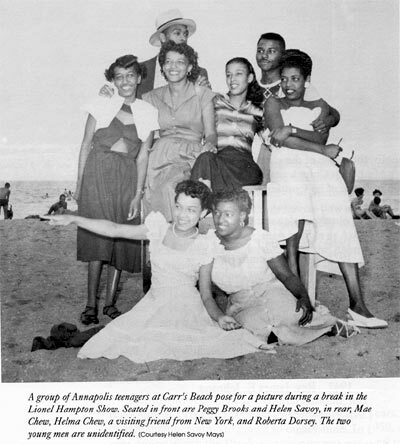 During the 50's and early 60's, Anne Arundel County was still segregated and the beaches for Negroes were Carr's Beach and Sparrow's Beach in Annapolis, and the beach communities of Highland Beach, Arundel-On-The-Bay and Columbia Beach in the county. Carr's Beach was the most famous of the beaches and was affectionately called "The Beach". During the week "The Beach" was a place for day camp, church picnics, etc. But on the week-ends especially Sunday afternoons, Carr's Beach had the unique distinction of being a major stop on the "Chitlin Circuit". Saturday nights grown-ups would go to the beach and see stars such as Ray Charles, Bill Doggett, Dinah Washington, Author Prysock, etc. Sunday afternoons was family fun. Thousands of people from as far away as Philly would come to the beach to swim and picnic. But at three o'clock it was show time and people would pack into the pavilion to see and dance to the Major R&B stars of the day. Stars such as Little Richard, James Brown, Lloyd Price, Etta James, The Shirelles, The Coasters, The Drifters. You name 'em, they played Carr's Beach. Physically, Carr's Beach no longer exists. Carr's Beach is a memory still upfront in the minds of many people "The Beach" then and now united people, it was ours in a land and a time that tried it's best to deprive us and keep us "in our place". When you talk to people today about The Beach, they can't stop talking , You see in their faces and hear in their voices ..GOOD TIMES.. PRIDE... A SENSE OF BELONGING. "The Beach" was sacred ground. For all intents and purposes of this project, the Carr's Beach Community, is the African American community encompassed in a circle radiating out on both sides of the Chesapeake Bay with Annapolis, MD being the hub. We're talking about Baltimore, DC, the Eastern Shore, southern Pennsylvania, southern Maryland, Delaware and points beyond. The phenomena of Carr's Beach was unique and it's a story that would interest the whole world. The author of this site has taken upon himself to document and preserve the history of Carr's Beach . To do this in such a manner that it is not an obituary, but do this while many of the people who made "The Beach" work and those who enjoyed it's pleasures are still with us.... CULTURE CONSERVATION. The Body and the Spirit still live. To encourage other African-Americans in the Community to document, including but not limited to, the history of their family, community, or organizations. Let's do this while people are still alive, and while photos, oral history, and artifacts are still available.. CULTURE CONSERVATION. We lived in an area during an era that was a melting pot for Blacks from the North and South. Where the members of the large employment conglomerates agriculture, maritime, industrial , government and military, inter-mingled more closely here than in other parts of the country. The Beach was the melting pot. To keep the community informed of events and other issues of interest. In other words, create a local internet Network.. In a light-hearted way. Carr's Beach taught us "C'mon Baby let the good times roll". Many of the younger people need us to show them what is really a Good Time (Life). Make this information available to the public through a monthly newsletter ,"The Carr's Beach Community Directory" published via the internet. As time marches on there will be more information to share, much of which will not be posted on the site. If you would like to be part of our mailing list and or be a contributor send us an e-mail. We use your e-mail address only for us to contact you, we do not share these with third parties. New e-mail address: Spammers have hijacked our old hyper-linked address and have bombarded us with thousands of junk e-mails. Our new e-mail address, carrsbeach@comcast.net is not hyper-linked; therefore, you will have to type it into your browser. Take a Trip on the Ship at the Chesapeake Incense Co.